"A man staying at a secluded historical mansion, finds his life being haunted by the presence of a spectre." I've often wondered if "The Changeling" started off life as a potential TV movie. It certainly has that feel about it, but maybe it's just because it was directed by Peter Medak and it's Canadian. It's not that there's anything wrong with any of those things as "The Changeling" is still one of the most terrifying ghost stories ever filmed and quite possibly the last horror movie from the '80s which is actually scary. 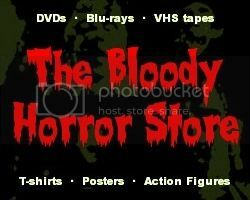 I'm not a big fan of the '80s as far as genuine horror movies go. 1980 itself was the cut-off point after slightly over a decade of horror which lived up to the dictionary definition. Horror became lame for at least another 25 years with only a few exceptions so I always think of "The Changeling" more fondly than I should. Objectivity has its place, but this is one of the rare occasions when I am going to be almost 100% subjective and merely state my opinion. It's not that "The Changeling" isn't without enough flaws for me to tear it apart, but you should all know by now that I'm not the kind of guy who does that just to attract more page hits. When I genuinely like something as much as "The Changeling", I am far more likely to go to the other extreme. Although the popularity would be great, I have no desire to turn into a sycophant either. Having said that, the one hugely negative thing which I have to say about "The Changeling" is that I never liked George C. Scott as an actor and felt completely alienated from his character in "The Changeling". Actually that's two things, but they hinge around the same person. The only way I would ever be able to identify with him would be if I was an old musician who suffered the loss of my entire family in a car accident and then went to live in a huge mansion. Apart from getting older, the rest of it is very unlikely to happen. My cats don't drive for one thing. Well, not that I know of. I also have no musical talent, and the chances of me living in a huge house with ghosties in is also not exactly on my list of things to do. Ghosties terrify me. Seriously, I have four things which I am truly afraid of: spiders, heights, drowning and ghosties. If I was ever stood on the top deck of a ship and a ghostly arachnid appeared that would surely be the end of me. Thus, you can imagine that when I have to face at least two of my phobias in a movie, it's not pleasant. At least "The Changeling" doesn't have any spiders in it. 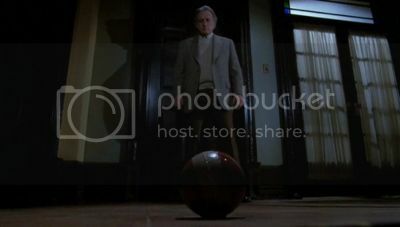 The ghost rolling a ball trope as shown in the picture above probably goes back even further than "Voices" (1973) although, of course, its most famous use is in "The Shining" which was also made in 1980. If you've seen it used too many times then it's kind of comical, but I think the scene in "The Changeling" where John Russell (George C. Scott) first encounters the phenomenon is by far the best example. If that had happened to me, I would have been out of that place faster than a DVD collector trying to get the closing down sale bargains at Blockbuster. I probably would have screamed like a little girl and wet myself too. Obviously that isn't even the most terrifying scene in "The Changeling" as just about everything in it once George C. Scott started getting haunted creeped me out when I was rewatching it last night. The séance was also pretty brutal to my bladder, and I'm surprised that we made it through to the end of the film without a flood. 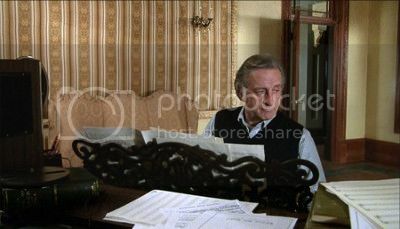 What made it worse was that I've already seen "The Changeling" about twenty times over the years and should know better! Maybe with Hallowe'en coming and being alone in the house with two cats who see things which aren't there really got to me. In case you wonder, there is a bit of a mystery for George C. Scott to solve in "The Changeling" which I can't say anything about without spoiling it for you. I really want you to see this film for yourselves if you haven't already so maybe this post is more about my reactions rather than a real review. Since "The Changeling" was made in 1980, before the trends of shakycams, bad CGI effects, and overly loud jump scares, there's nothing bad that I can say about the way it looks or sounds at all. I could criticise how the acting is sometimes a little bit TV movie-ish, but given the background of most of the talent involved, it's still high-quality TV movie acting not soap opera stuff. "The Changeling" is simply one of the most atmospheric (and even claustrophic) movies in my DVD collection. Even if you are one of those stupid people who doesn't believe in ghosts (or anything else), the internal logic of the story still carries it. I'll be blunt about it, "The Changeling" should be in everyone's collection if they want to be thought of as a true horror fan. You won't get much better than this.